These past years have seen the rise of the sneakers and sneaker culture, having everyone from celebrities and influencers to you and I incorporating sneakers to our #OOTD. Besides wearing sneakers for their comfort value, it is also for style. Brands have shift their focus to make their sneakers more stylish in order to appeal to not only males but females as well. So many style shots are filled with not only casual outfits, but semi-formal, office-wear and more with sneakers as the preferred footwear. One of the most famous sneakers that took the world by storm is the Adidas NMD. The designer behind this global fashion phenomenon, Nic Galway, wanted to create a product that one would feel comfortable wearing especially in terms of look, comfort, and functionality. You’d expect the hype of this sneaker to die out like it’s predecessors, the ZX Flux as well as Nike’s success, the Flyknit Racer, but it didn’t. It keeps getting more famous, and more hyped. Unlike the Adidas Yeezy or the Nike Air Jordan, the Adidas NMD is not associated to any celebrity. The popularity of the Adidas NMD is not surprising especially since it is from the Boost family. The famous Boost tech line was hyped, all thanks to Kanye West who was seen wearing the Triple White Ultra Boost on stage. The NMD is most probably hinging on the past success of the Ultra Boost. But unlike the Ultra Boost, the demand for NMD is consistent and Adidas has been able to keep up with it. The Boost tech line is not only comfortable, but also attractive. It looks nothing like a running shoe. Its upper layer is attractive and pleasing to the young crowd, making it the best of both worlds – a lightweight and casual sneaker that looks great and embraces modern tech. Besides that, it is much more attainable than the Yeezys and cheaper than the Ultra Boosts; making it one of the sneakers that many people want so much. It does not compete head to head with the Yeezy and Ultra Boost but rather, a complementary by-product for the Boost line. Due to the limited quantity available in the market and the global hype about it, the resell value of the NMD is very high. The OG runner could go up to RM1500 if it is BNIB (brand new in box), and other variants have around a 10% price increase when it is resold, but could go up to a 120% price increase if it is a rare colorway. People get bored easily, that’s a fact. Somehow, Adidas has been able to keep the crowd hyped about the NMD by releasing new colorways consistently as well as different designs, but never once strayed far from the OG design. One of the goals of the VP of Global Design for the NMDs was to make NMD recognizable from miles away and frankly speaking, I think they’ve achieved that very goal. It contains references to archival Adidas models like the Micro Pacer, Rising Star and Boston Super. (I know what you’re thinking, I’ve never heard of those shoes too until now). The blocks on the sides of the NMD is not there just for recognizable decoration; it has a purpose. It helps to support the Boost foam as well as provide some level of structure and stability to the Primeknit because there is no lining or reinforcements in the shoe. You kind of forget the three strips Adidas shoes are known and recognized for. The holes on the sole allow the Boost to move freely to get the best energy return; what Boost is made for. The heel mustache on the back allows reinforcements on the outside as well. The piece of fabric on the back makes getting in and out of the shoe much easier, according to NMD owners. The results are something familiar to Adidas, but also completely new. 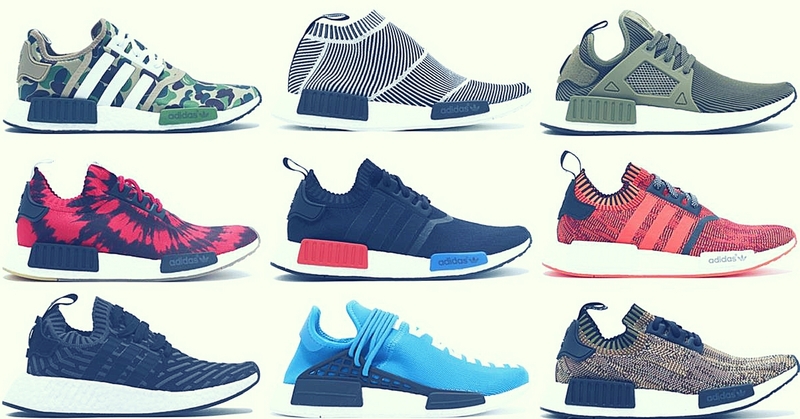 You must be wondering, “Why am I seeing so many different looking NMDs? Are some fake?”. It is also known as the NMD Runner. It’s the most sought-after type of the NMD compared to the rest. It is a low-top sneaker that features either a mesh, neoprene, Primeknit or suede upper, 2 plugs on the outer part of the shoe and 1 plug on the inner part of the shoe. It usually retails for RM560, with the Primeknit variants going for RM760. The XR1 is a more high-top version of the R1, but with added elements. First off, it has some sort of support contraption on the side of the shoe, where the three strips are supposed to be, connecting the laces. The fabric at the back of the shoe are slipped in like a belt on the mustache. It usually retails at RM690. A collaboration with Pharell Williams, it explores humanity and celebrates cultural diversity. HU is short for Human – human being, human race – as well as a reference to colour – Hue. It comes with a two-piece upper with wordings boldly printed on the top of the shoe, a curved collar and a combination lace system-stabilizer cage. It also comes with a Primeknit upper, the 2 plugs + 1 plug on the sides of the shoe and a ‘reflexology-inspired’ insole. It usually retails at around RM610. The R2s are the new and second version of the NMD R1. It features the same upper materials like mesh, suede, neoprene and Primeknit. The changes are the plugs on the sides of the shoe. The outer side has no plugs, but is replaces almost-invisible stripes that are embossed into the Boost sole. It kept the 1 plug on the inner part of the shoe but changing its shape to a bigger and irregular plug. The fabric on the back of the shoe resembles the XR1. It is not as popular as the R1, therefore its resell values are not as high either. Also known as CS, it is literally as the name states; it’s like a sock. There are no laces or ‘support’ on the upper part of the shoe. The plugs resemble the R1 and XR1. It has a Primeknit upper. It usually retails at RM750. The second version of the City Sock, the CS2 features a newly-designed upper that consist of an ‘opening’ in the outer part of the shoe. The plugs on the side resemble the R2, only having one plug in the inner part. It usually retails at RM740. This is not a type of NMD, but a type of material used for the upper of the NMD. A sport shoe is usually made of several separate pieces but the Primeknit method digitally knits the entire upper in just one piece. The yarn is knitting fused and it is used to fine-tune the exact amount of flexibility and support needed in every part of the shoe. Long story short, you’re able to tell if it is Primeknit by the feel, by the name as it states PK if it is Primeknit as well as the comfort of the shoe as it feels and looks like a sock. It is considered a timeless design and a ‘canvas’ for endless revisions, deeming it to be a hyped sneaker for a very long time as it will keep feeding the crowd new colorways and designs. On the contrary, it is said that the hype is slowly dying due to new releases from other brands like the Nike Vapormax and comebacks like the Vans Old Skool. Will you cop a pair? If you have already, is it worth the hype?